Culinary Tip #8 Ten Thousand Hours of Mastery! One of the theories that holds me enrapt is one that Malcolm Gladwell talks of in his book Outliers. It originated from Dr. K Anders Ericsson and it discusses the ten thousand hours of mastery. It fascinates me because it shows over and over that no matter economic status, gender, background or a slew of other variables, that if someone practices they will always catch up to someone with inherent ability. Anyone can achieve a level of mastery at ten thousand hours. Do you know what that means? That means my mother was right about practicing the piano, and seeing that now is really irritating. It was Susana’s birthday on Sunday. HAPPY BIRTHDAY SUSANA!!!!! Business partner extraordinaire and best friend. Anyway for her birthday, which she reminded me about on a regular basis, she wanted a lemongrass lime coconut cream pie with lime graham crust. Guess what people, you don’t need a recipe to make something that your friend has completely pulled out of her… head… and has to have to make her birthday complete. All right you need one recipe pastry cream, but even then, you are changing it quite a bit. Thank goodness for the pig and the magical animal that it is. I don’t really care which part you are serving me I will happily eat it. I am a total utilization food girl. And yes deep-frying is cheating; you can make it taste good in many other ways. Cooking Tip Week 5ish Taking the Mystery out of Meat Cuts! 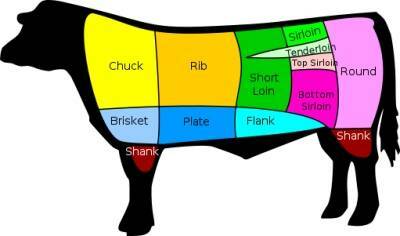 Let’s talk about meat. As a teacher first and foremost I get really irritated by the packaging in grocery stores. It gets more and more confusing trying to figure out what’s what in the meat department with all of the marketing terms that they use. It seems like it’s meant more to fool you than to help you to make a decision about what you want to put on your table for your family. PCW Cooking Tip Week 4 Burnt Pan Be Gone! Sorry I’m a couple days late, it took a couple days to recover from Teen Week, but we had a total blast and so did they. It’s nice to know that we helped a few kids learn some valuable life skills. If you missed it, it was so popular we scheduled another for Aug. 22-26th Sign up now before it fills up! So this is a quick tip though highly valuable. If you are anything like me, the more I multitask the worse the individual results. I have to rely more and more on timers and reminders and the really messed up part is I even need one to remind me that I’m filling the wash sink. What??! It’s full of bubbles people, it doesn’t make any noise! I don’t remember until I hear the water pattering on the floor. My whole chicken comes with a little bag in it. When you buy whole chickens in the restaurant world you usually buy WOGs, or WithOut Guts, when you buy whole chickens at the regular grocery store most of the time they come with a little papery bag inside that contains the liver, kidney, heart and neck. I’m 100% sure that the pieces in that bag did not come from that same chicken, but you’ve got ‘em so you might as well use them! Today we are concentrating on the livers. Save them! Put them all into a little baggy and throw them into the freezer until you get enough to make a cup or a pint depending on how many people you are feeding or how much you like Chicken Liver Mousse. So did you dig last week’s tip? Well consider this part two! But before we get to that a quickie update on what’s new at PCW. Our fundraiser for the Sauvie Island Center went smashingly and we were happy to be helping out such a great cause by teaching people how to make good food. It was a win win for us. Check them out because they have a barn dance happening on the 30th of July complete with BBQ that sounds like the bees’ knees. Our Teen Camp for next week is sold out! We promise that next year we’ll run it for two weeks and add advanced classes for those participating this year! My in-laws were in town this week. That may not be a surprise to some of you who follow us on Facebook and saw dinner being made for them. One of the many activities we did was head over to the coast and spent a few hours in Cannon Beach. There is a cute little wine bar called Lush on the south side of downtown. We sat on the plant filled patio in the sunshine (yes really there was sun) and drank wine and beer and had snacks. Have you ever been part of a company that does “Forced Family Fun”? That’s what we heard Team Buildings called today and maybe Team Building has become a four letter word these days. I know that I’ve been dragged (literally) to mandatory bonding events where I had to bowl or play laser tag or do a trust fall with my colleagues when I’d rather be getting work done or actually be engaged in a fun activity (though laser tag was a cathartic slaughter of my boss). How about we take back Team Buildings and make them a good time where you can take something that is essential, almost primal, and simple, and break bread with each other.